How to Make Basketball Shoes Less Slippery and Having More Grip? Basketball courts can be quite slippery which is bad for the game and can be dangerous for the players too. Players need to be able to make quick turns and change direction fast, which is why reliable traction of the outsoles is crucial. This is why having basketball shoes with a good grip is very important. 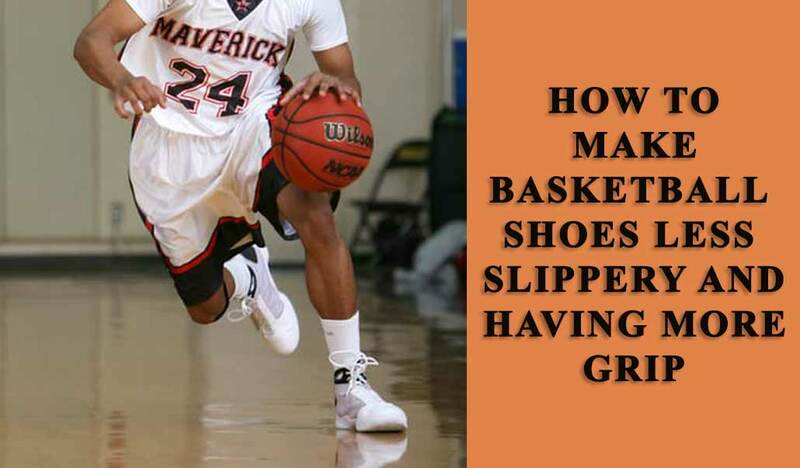 Make sure you clean the outsoles of the shoes with a damp cloth after practice or a game. Do not wear the basketball shoes outside, because they accumulate dust and dirt and become slippery quickly. You may want to clean them at half time as well. The basketball court should be swept with a dust mop regularly too. Make basketball shoes sticky: You can try sticky mats or some special grip lotions to improve the stickiness of the outsoles. These products are poured on towels, which are stepped upon by the players before getting out on the court. When you notice they are becoming slippery moisten them with a damp towel or running a sweaty hand through them to wipe off the stuck on dust and dirt. Make sure you replace your basketball shoes once their tread becomes worn out. Make sure you purchase high quality basketball shoes, which are made to provide the grip necessary for the quick turns and stopping required by the game. How to make basketball shoes have more grip? You can try to improve the grip of your outsoles by sanding the bottoms of the shoes with low grit (40-60 grit) sandpaper. Rough them up with several swipes, which will improve the traction. You can use a paring knife to make tiny cuts in the outsoles, but be careful not to puncture them. If you can afford it, make sure you have separate shoes for practice and for games. This way your shoes will remain less worn and dirty and will more likely provide the traction you need to play quickly and efficiently during a game. Get a reputed brand for your competition shoes. They may cost more, but given that they are made to provide the ultimate comfort, grip and support during the quick turns and direction changing. They can improve your performance and keep you safe from slipping and injuring yourself, so think twice when you are shopping for the best basketball shoes next time!